Akwasi Afriyie (Rosky), GN RADIO, UK. Former IBF Welterweight World Champion, Joshua has refuted recent media claims that, he has retired from Boxing. Speaking to Akwasi Afriyie (Rosky) on GN RADIO UK’s Sports Programme during the weekend, he said the speculation was as a result of a comment he had made in the aftermath of his last fight which was against Tanzanian Mfaume Mfaume. It will be recalled, that, prior to the Mfaume Mfaume fight on 8th March this year, Clottey hadn’t fought since his unanimous decision loss to Gabriel Rosado which was contested at middleweight. That was way back on 19th Dec 2015, over three years since he last boxed. Three years of inactivity in many professional fields is a really long time, even more so in sports. It’s an eternity. A retirement. 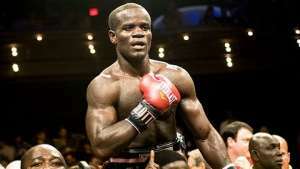 As a result of this long period of inactivity, many had already claimed Clottey had retired. There were others who questioned the wisdom in the 41-year Clottey fighting someone who was born just some 3yrs before Clottey himself made his professional boxing debut. Perhaps, prompted by some of these uncomplimentary but ultimately, truthful comments, Clottey said he was going to use the Mfaume Mfaume fight to find out where he stood in his boxing career. As it transpired, Clottey stepped into the ring on 19th Dec and he earned a TKO over the much younger 26year old in the 6th round of a 10 rounder. Now here is something that may shock a few people. Clottey even played football a day after the fight. I remember I sent him a message a day after the fight, just to find out how he was feeling. He wrote back: “I am fine, I even played soccer this morning”. Crazy stuff! Who has a professional boxing match on one night and plays a football match the next morning? Well, that is Joshua Clottey. He reckons he is quite a good footballer too. According to Clottey, he only said the media had written a lot about him so now that he had won he was expecting them to ask him to keep fighting, at least to congratulate him on his very convincing win. After a series of some well calculated hefty shots to Mfaume’s body, the Tanzanian had retired on his stool. In a way, he was “retiring” and was waiting for the media people to tell him to come out of “retirement”. He was giving members of the media and the public the chance of a “referendum” on his future in the sport. I would call it tongue in cheek, mischief. When asked about a potential fight with Saul Alvarez which had looked so close (it was as good as a done deal in 2014 but which never actually materialised ), Clottey revealed he had already been given $40,000 as training fee. However, according to him, Alvarez’s camp went a bit cold on the fight and claimed their fighter had sustained an ankle injury. Clottey, however, refuses to accept it as genuine, as he claims, the Alvarez camp may have heard about how hard he was working the punch bags after he had been visited by HBO during one of his training sessions and felt his style would be a problem for Alvarez. In his own words, they “chickened out”. He was gutted because he felt that was his chance to redeem himself after the flak he had taken after that high profile fight with Pacquiao back on 13th March 2010. Clottey also had a few words for current IBF lightweight champion, Richard Commey. He feels it may be too soon for Commey to take on Lomachenko as Ukrainian is “too crafty”. On the upcoming rematch between Ghana’s former WBO Sper Bantamweight Champion, Isaac Dogboe and Navarrete of Mexico, for the Royal Storm to triumph over the Mexican, he would need to work on his defence. 5 losses and 1 no contest. Three of the five losses were against boxers I would call “Hall of Fame fighters”: PACQUIAO, COTTO AND MARGARITO. He even disputes the official result of a loss (Split decision) against Miguel Cotto.